an enjoyable exploration of the essential aspects of English grammar. These 24 spirited and accessible lectures offer you a comprehensive core training—a linguistic "boot camp," by which we mean a thorough immersion in all of the key elements of English grammar and usage, in their most immediate, practical application. 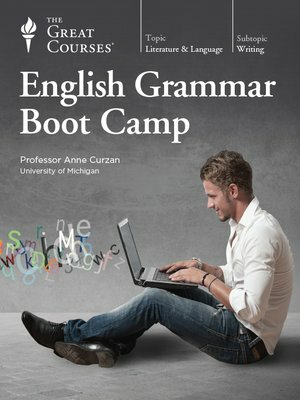 The delightful and superbly insightful lectures of English Grammar Boot Camp offer you a unique opportunity to explore the linguistic riches of the English language, and to significantly deepen your mastery of grammar, usage, and style. This mastery will enable you to use English more competently and confidently in every context.